/After Placing my Order /Why can’t I make changes to a design I ordered? You can only make changes to a design you ordered if the production process hasn’t begun and your order status is listed as Reviewing. If you’d like to make changes to a design you’ve ordered, check to see what your order status is by logging in to your account and clicking on the Saved Designs link near the top of the screen. You can also see the order status in the ‘My Orders’ part of the dashboard while logged into your account. After clicking on the design you want to edit, you will be taken to a page that lists your order number and details. Here you can view the status of your order. 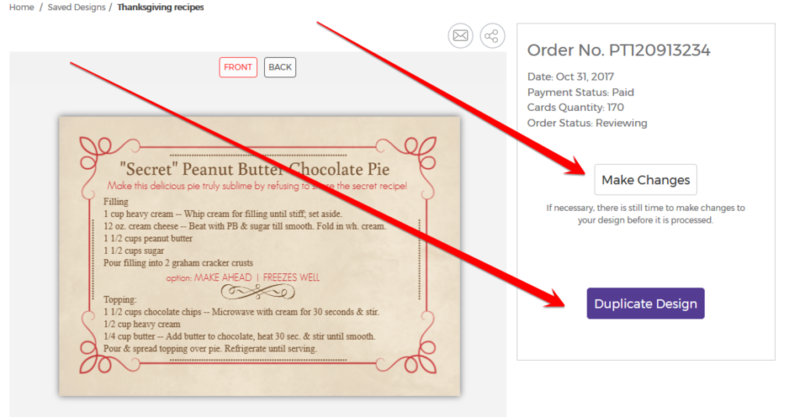 If your order is listed as Reviewing, you can still make changes to your design by selecting the Make Changes button. If the Make Changes button is still visible, we have not yet begun processing your order, and as such, changes can still be made. If your order status is listed as Pending, the printing process has begun and you’ll be unable to make changes to your design. We lock your design at this point as changes would interfere with the printing process. If you’d like to make changes to a design that’s Pending, please contact our customer service team ASAP, and we will see what we can do to help. If you don’t want to make changes to a design you ordered, only personalize it further for a different order, you can hit the Duplicate This Design And Edit button, which will open your design in a new window — allowing you to continue personalizing it and save it, in addition to your original design. If your order status is listed as Printed or Shipped, your design has been printed and you can no longer make changes at this point. Again, you can hit the Duplicate button to personalize the design for a different order.